Extra Keys Pro is a special commercial edition based on the free Extra Keys tool but with the important additional feature of being able to output each character in several different encoded formats. In this case "Pro" stands for "Programmer". If you need to edit HTML web pages or program source code files then this is the edition for you. There are many situations when it is not safe to use the plain character in source files They should instead be entered as an HTML entity, decimal or hexadecimal code. Extra Keys Pro gives a method to do this very quickly and easily, with a single click and without needing to remember any codes. There is no trial period, the code is simply entered on the first run of the program. To evaluate before purchasing, please look at the free standard edition of Extra Keys. It looks and works exactly the same, but only outputs characters. 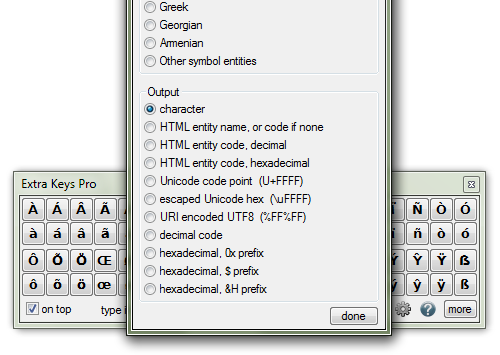 The Pro edition has a different settings menu for choosing encoded output formats. The licence code will be valid for all future versions.